Kidneys reabsorb the essential elements and remove the water-soluble waste products from the blood and hence are among the most vital organs of the human body. The incidence of functional damage of the kidney is common across the world. According to the WHO estimates, more than 1.4 million people worldwide undergo renal replacement therapy every year which results into considerable increase in the incidence rate of chronic kidney disease. The symptoms which indicate a problem related to kidneys include high blood pressure, blood in urine, difficulty in urination, frequent urges to urinate, and swelling in the hands and feet. Globally, growing number of individuals suffering from chronic kidney disease, rise in the aging population, and increasing incidences and prevalence of diabetes are the prime growth drivers of global kidney function tests market. In addition, increase in incidence rate of renal fibrosis, and emerging economies such as China, India and others, will create new opportunities for global kidney function tests market. However, higher cost of treatment and stringent regulatory approvals are the key restraints for global kidney function tests market. This report identifies the global kidney function tests market size in for the year 2014-2016, and forecast of the same for year 2021. It also highlights the potential growth opportunities in the coming years, while also reviewing the market drivers, restraints, growth indicators, challenges, market dynamics, competitive landscape, and other key aspects with respect to global kidney function tests market. Geographically North America dominated global kidney function tests market, and Asia Pacific is projected to have fastest growth, owing to higher incidence rate of chronic diseases, growing patient awareness and rising demand for advanced diagnostics and therapeutics regimens for chronic kidney diseases in developing nations such as China, and India in this region. 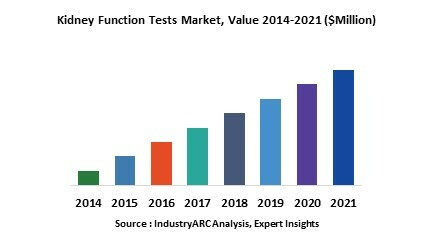 Among all the test types, concentration tests have the highest market share in global kidney function tests market. 8.3. Otsuka Holdings Co., Ltd.